My stay here in India has been an experience that has helped me truly appreciate all of the resources and opportunities that I have back home. That’s one of the most cliche things to say about a study abroad experience (gross I know) but I truly have learned to appreciate even something as basic as clean, fresh-smelling air, a relatively clean ground beneath my feet or a clean restroom that is easily accessible with toilet paper (I’m not gonna say every restroom I’ve been to in the U.S. always has toilet paper but you can generally take it for granted). My complaints about my stay in India are entirely influenced by the place I grew up in and the privileges that I’ve been given throughout my life. That is, I only have these complaints because of the standard and way of living that I grew up accustomed to and not necessarily because it is the best way or even the better way to live. So, this blogpost is a reflection and appreciation for what I have been fortunate enough to have through my life. 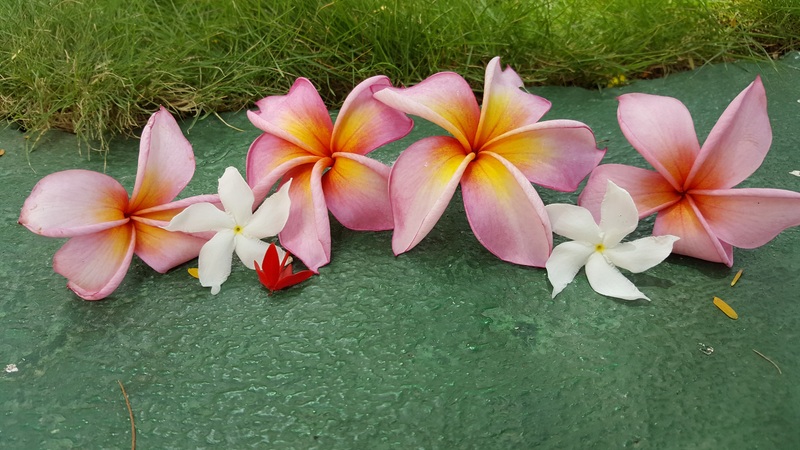 Pretty flowers that Evelyn arranged while we were staying in the Ideal Beach Resort in Mahabilapuram. Photo taken by Heather Lowe. I’ve been fortunate enough to have grown up in a middle class family where, although there have been occasional struggles, my parents have managed to keep me and my 3 siblings fed, with a roof over our heads and provide us all with a good education. Many people here can only dream of that. And those that achieve a middle class living are only able to escape the realities of the world they live in for a limited time in certain sections. Perhaps it’s easier for them to accept and deal with what they see because they’ve lived in it for so long but coming from the U.S., it’s quite a shock. At least in the U.S, I already know or am shown which places are acceptable for me to be in by society’s standards. Here, I am exposed to all types of living conditions ranging from the very fancy to the incredibly poor. The nature of our program also causes us to see so much more of India than the average Indian might as they know and only circle the areas in which it is socially acceptable for them to be in, just like in the U.S. In India, though, people might be even more strict in sticking to the places that society deems acceptable to a person of a specific background because of the tradition of the caste system and all of it’s implications on society. The average Indian might notice all of the trash littering their streets and not enjoy it, but if they’re middle class or higher, they can avoid it completely by never walking on the street and instead driving everywhere or by avoiding going near the poorest and/or dirtiest areas. Of course, this is what most people in the U.S. do but the U.S. is a much more prosperous country to begin with so the differences in the way people live are less noticeable and they exist much more spread out from each other. Here in India, you can see a neighborhood that looks nice with expensive looking stores right next to a neighborhood that is full of trash or a slum right next to a busy street. I fully realize that my experience in India has also not been without the transfer of privileges from my status in the U.S and even some privileges I hadn’t expected to have. Although people here treat me as a noticeable outsider sometimes, especially when I’m with people from the group, in general I can blend in fairly easily. While staying in Chennai for the second time, I took a walk outside of the Madras Christian College campus that we stayed at the time and noticed that I got much less stares in my direction than I normally had when I went out with some of the people from our group. I realized that they have probably seen a lot more Asian people and someone told me that I could even possibly pass as a Northeast Indian. I therefore blend in pretty well or that not too many people take a care to noticing me. This gives me the benefit of not being directly and adamantly asked for money as we walk down the street or wait for our Uber. Some people still have come up to me and asked me for money, without a doubt but I am generally not their first target. I am also not blatantly stared at (too often) or asked to take a picture with some random family that notices me at a monument or national park, which has happened several times to other people in our group. Sometimes anonymity is a privilege. I also have the privilege of having enough money to go out to different places in Ubers on a consistent basis. All the places we go to are generally nice quality places with a nice atmosphere and clean amenities. In India, I am awarded a higher status simply because I have foreign money and act in a way that shows people I am from a wealthier background, from the U.S. While I could have known about some of these privileges beforehand, for example I knew the exchange rate between the two countries and that the U.S. has an economy with a much stronger currency, I didn’t know how much that would affect me and my friends in a positive manner. I could never imagine eating an entire meal that filled me up in a 5 star hotel for about $13 USD and that was most probably the most expensive meal I’ve had here. Most other meals are around $5 or less. Many of the privileges I’ve experienced here were unexpected though, like the fact that I’d be traveling in Ubers all the time or that I would not be asked to take pictures constantly. I think it makes sense to start to see and understand more easily the privileges that I benefit from every day when in a country so different to what I’m used to. You don’t need to go to a new place to know what privileges you have but I think you do have to if you want to feel, process, and finally understand them in a more concrete manner than ever before. 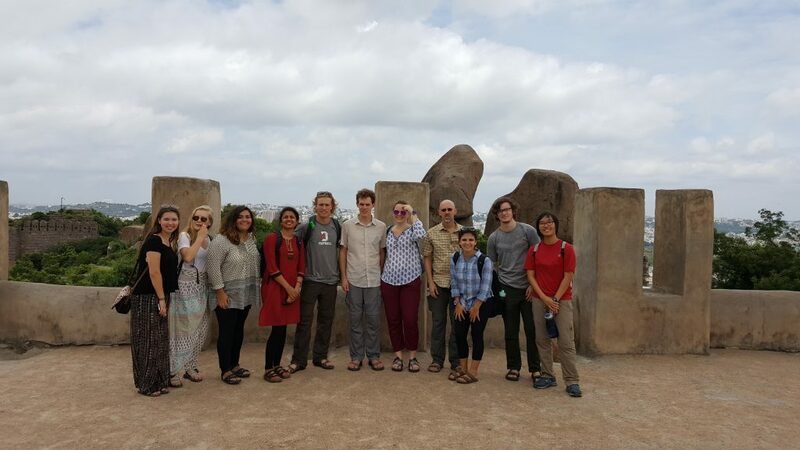 Group picture while in Hyderabad; Left to right: Kassidy, Emma, Hannah, Manleen, Stephen, Peter, Sophia, Dr. Paradise, Reyna, John and me. Photo taken by a kind stranger on my phone. Previous Post: « Transecting Hyderabad: The Communal Power of Water. Love the picture of the flowers! Coming from Jamaica, your father and I were exposed to some of what you’re going through in India. In my high school I had joined a club that took us to the less fortunate areas in Jamaica so that we could appreciate what we had in life. There’s always someone else worse off than yourself and it was a life lesson well learnt. The experience humbled me and made a great impact on me as a teen. As an adult running a bakery with your father in St Ann’s Bay, I remember visiting the home of one of our employees only to find that he lived in a one bedroom structure with his parents and siblings and the floor of that structure was a dirt floor….no tile or carpet. The bathroom was an out house and all the cooking was done outside. I am thankful for the opportunity you had to broaden your horizons via Davidson in India. I’m sure it will stay with you for the rest of your life. I look forward to your next blog.